Toric lenses to correct astigmatism. 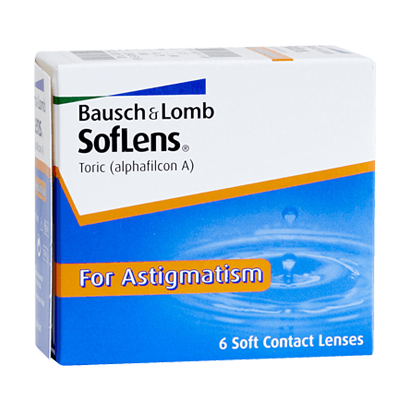 SofLens Toric contact lenses offer effective correction for the issue of astigmatism. These toric contact lenses ensure your vision is sharp, clear and uninterrupted from morning until night. Bausch & Lomb have specifically designed these toric lenses in a way that they remain stable on the eye, adjusting and refocusing light to a point at the back of your eye. This feature delivers clear vision you can rely on, no matter if you are short-sighted or long-sighted. These toric lenses are the perfect solution for correcting astigmatism. SofLens Toric contact lenses are made from wettable material, achieving a 66% water content that keeps your eyes moist and hydrated, making them feel fresh and healthy all day long. These lenses are also deposit-resistant, minimising the chance of irritation or catching infection. SofLens Toric monthly lenses need to be removed each night before going to bed in order to maintain their quality and comfort. To ensure that they remain hygienic, the best and the easiest way to look after them is to clean them with a multi-purpose solution such as Renu Fresh Multipurpose solution. Air Optix for Astigmatism are recommended as alternative to SofLens Toric. Biofinity Toric is recommended as an upgrade to SofLens Toric in terms of water retention.